Nothing sounds quite like an Octaver, and Rocktron makes that point with the introduction of the Black Rose! Part of the Rocktron Boutique Series of stomp boxes, the Black Rose comes in a rugged metal chassis with retro-custom designed, laser-etched artwork. The Black Rose Octaver is a true bypass pedal: when turned of it is out of the signal path. NAMM – MXR Bass Innovations announced, yet, another phenomenal bass pedal, the M-288 Bass Octave Deluxe. 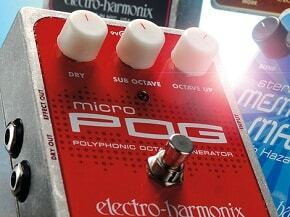 This pedal offers bass players true analog tone, pure bypass, and a large array of tone-shaping options. A single 9 volt battery powers this insanely phenomenal pedal. MXR’s 18-volt Constant Headroom Technology provides studio-performance headroom and superior tracking. Utilize the “Dry” knob to mix your direct bass signal with the octave effect, or hit the “Mid+” switch to add up to +15dB of internally adjustable low-mid punch and midrange pop, all this helps produce your killer sound.